The Insteon Smoke Bridge allows your Insteon system to receive wireless signals from select First Alert ONELINK line of smoke and carbon monoxide detectors so that when smoke or CO is detected, not only will your detectors sound, but your Insteon system will be alerted as well. By combining the Smoke Bridge with an Insteon Hub or ISY994 or other compatible automation controllers, smoke/CO events can trigger additional actions. Consider the value of being able to turn on your Insteon lights automatically in case smoke is detected, or receive an email or SMS alert! NOTE: The Insteon Smoke Bridge is NOT compatible with the First Alert AC10-500A or DC10-500A or any of their HomeKit WiFi enabled detectors despite having the same ONELINK Branding. 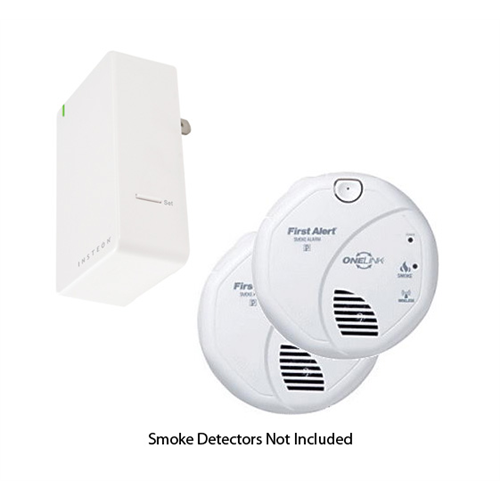 It is compatible with the detectors listed in the Insteon Smoke Detectors Category.